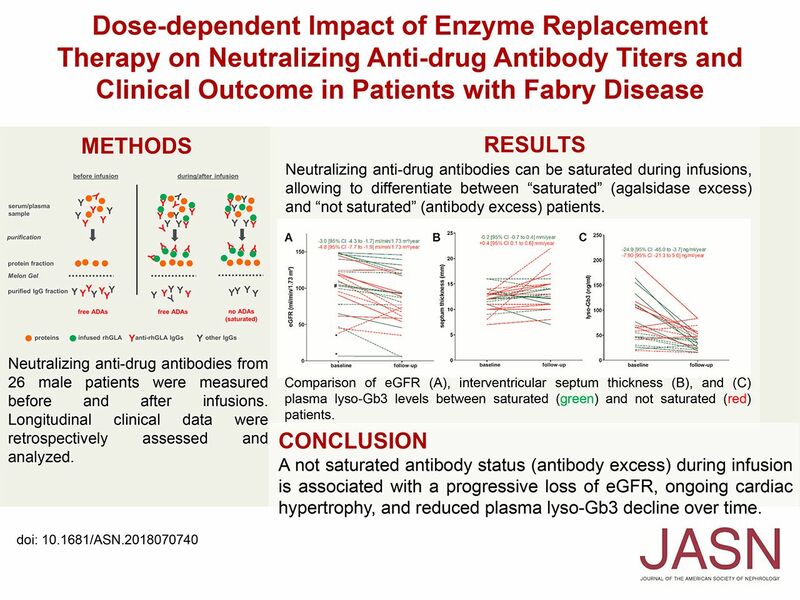 Background Use of enzyme replacement therapy (ERT) to treat Fabry disease, caused by deficient lysosomal α-galactosidase A activity, can lead to formation of neutralizing antidrug antibodies (ADAs). These antibodies are associated with increased accumulation of plasma globotriaosylceramide (Gb3) and disease progression. Because agalsidase ERT can saturate ADA-binding sites during infusions (achieving agalsidase/antibody equilibrium), we investigated in this open cohort study whether saturated patients (who have excess agalsidase after infusions) experience better clinical outcomes compared with not saturated patients (who have excess ADAs after infusions). Methods We isolated ADAs from sera of 26 men with Fabry disease receiving ERT (for a median of 94 months) and determined the amount of agalsidase necessary for antibody saturation. Clinical and biochemical outcomes included measurements of eGFR, interventricular septum thickness, and lyso-Gb3. Results ADA titers decreased significantly in all patients during infusion. Agalsidase-α and agalsidase-β had similar ADA-binding capacity and comparable ADA saturation frequency. Fourteen patients with saturated ADAs presented with mild (but significant) loss of eGFR, stable septum thickness, and significantly decreased lyso-Gb3 levels. The 12 not saturated patients had a more pronounced and significant loss of eGFR, increased septum thickness, and a smaller, nonsignificant reduction in lyso-Gb3, over time. In three patients, dose escalation resulted in partially elevated ADA titers, but importantly, also in reduced lyso-Gb3 levels. Conclusions A not saturated ADA status during infusion is associated with progressive loss of eGFR and ongoing cardiac hypertrophy. Dose escalation can result in saturation of ADAs and decreasing lyso-Gb3 levels, but may lead to increased ADA titers.